CLEGK2 - MM2008 Handheld Digital Thermometer with Integral Timer and KS01-S Dual Surface/Immersion Probe. An ideal kit for water temperature testing to aid legionella prevention. • Ribbon band sensor sealed with Silicon Rubber compound to ensure the probe is fully waterproof. Do I need to buy a probe with my thermometer? If you don't have any kind of probe, you won't be able to use your thermometer. A thermometer, as we have established, translates a signal from a probe or sensor, therefore in order to have something to translate, you will need to plug a sensor into it. Be careful though, as some thermometers are supplied complete with probes, or have probes built-in. For example, TME's SOLO thermometer has a built-in needle probe, which is attached to, and swings out of the body of the thermometer. If you need a thermometer which you only use for one application (such as measuring core food temperature), these kinds of thermometers are a useful option. If, however, you know that you want your thermometer to measure different types of things (air and water, for example), you may want to think about a temperature kit. 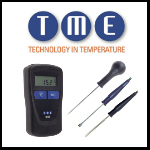 These offer a thermometer with (usually) more than one different type of probe, and TME offer a wide variety, tailored for different applications. All our instruments have a voltage reference, and they use this to check their own calibration 'Self-Calibrating'. However although this gives us excellent long term stability for many customers they also require an annual calibration check or certificate to external sources. How can I switch between °F and °C? What is the Thermometer for Life guarantee? The Thermometer for Life guarantee promises that TME will repair/replace any TME thermometer that is accidentally damaged or malfunctions for no more than £35 (+VAT) for an MM2000 series thermometer, or £125 (+VAT) for an MM7000 series thermometer. As the name suggests, this guarantee is for life and exists outside of your normal warranty. If your thermometer won't turn on, the first thing to do is to replace the batteries with fresh ones. If this makes no difference, you may need to phone or email us to set up a repair. To test the calibration of your thermometer yourself, prepare a solution of ice and water, and insert your probe into it. Your thermometer should read 0°C. If it is out of calibration, firstly try using a different probe, just in case it is your probe that is faulty, and if that doesn’t make a difference, contact us for advice – you may need to send your thermometer back for a repair/calibration.